What's the perfect way to end a fun day at the botanical garden? Trying Ethiopian food for the first time! Our family tried a lot of new-to-us foods during my 43 New-to-Me challenge, so it's only logical that 40-4-Steve would involve trying new food. We decided to find an entire cuisine that was new to us. 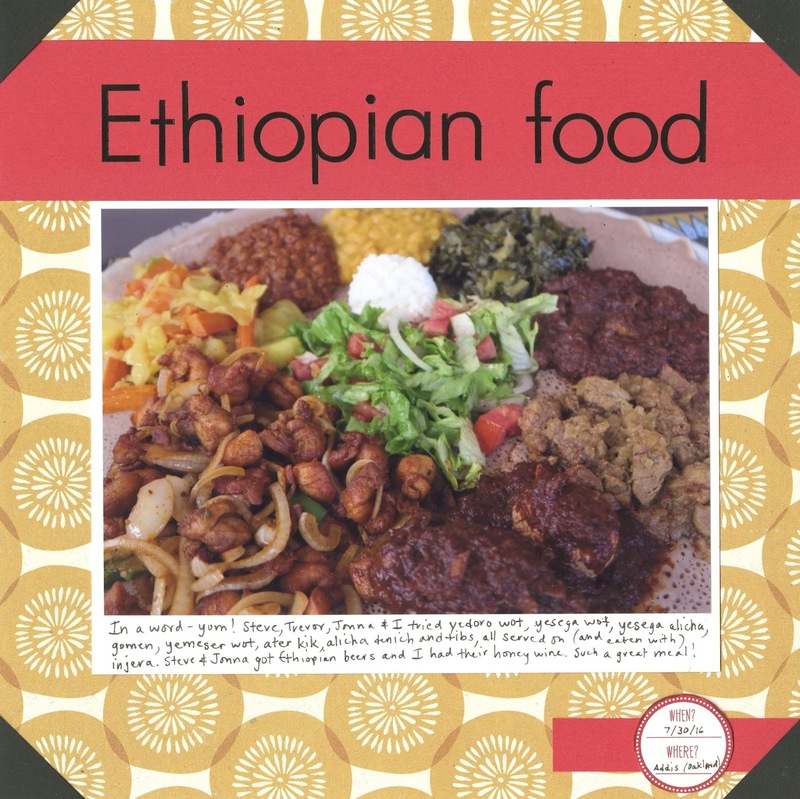 We've had so many different foods though, that it was a challenge... until I saw a Groupon for Addis Ethiopian Restaurant in Oakland, just down the hill from the botanical garden. Perfect! We told our waitress that it was our first time trying Ethiopian food and that we wanted to sample as many different things as possible. She brought us a huge round tray covered with injera (basically a sourdough flatbread) topped with many delicious items. We each had our favorites, of course, but there wasn't anything that at least one of us didn't like! What a fun (and tasty) experience. How fun! LOVING this page! Great pic!!!!!!!!!!!! Oh wow that looks delicious!!!! Also loving your choice of BG paper for your layout!